It is my great pleasure to welcome you to Ober.net's brand new Character Reform School. There's no need to feel any guilt or shame about being here: all of us here know that sometimes characters won't do what they're told. Sometimes, it's out of your control and that's why Character Reform School exists. We can't promise that we'll fix your characters or set them on the path you intended for them, but at least you can list their crimes here. We can give them a corner to sit in while they think about what they've done. This is a place for us to visit when characters just won't do what they're meant to do. 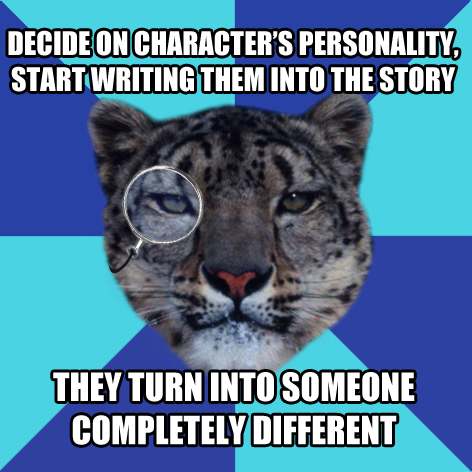 When characters do exactly the wrong thing (and it annoyingly turns out to be the right thing). This is where you can come to rant about major characters who didn't like the attention and minor characters who staged a coup and took over the story. Bring us your misbehaving characters and share your frustrations with a bunch of writers who know exactly what you're going through. As emerging writers, writing isn't (unfortunately) something we can actually do full time. We must squish our words into the brief moments between work and sleep and school, but this oft isn't the only chance for our brains to be working away . . . you know, busily adopting bunnies even though you're already busy feeding one all your carrots. It's difficult to raise any plot bunny to completion when you have another hoard bouncing around your feet demanding attention and stories too. So instead, send them off to the day care centre where they can sit and be looked after until you're ready to work on their project too. I'm going to be rude and go first. Al was meant to be a vaguely annoying character in my main character's past, who just happened to have gone into the same career as Jackie (my main character). He was meant to be a minor character. Jackie was meant to develop a strange fascination for someone else entirely, not Al! But nooooo, Al had to be all well-meaning and intelligent and now Jackie's more intrigued by him than she was ever meant to be. Actually, maybe I should have brought Jackie here, too. The worst bit is: the story's much better now that Al decided to be all interesting. Dammit. I'm meant to be in control of this business, not my characters. I have such a character, though it has been some time since they staged their coup and thus I have already reprimanded them by ensuring they are even more pathetic than my actual protagonist--which, trust me, is saying a lot--so I think he's already been adequately disciplined. Well, since we are sharing stories and even though I've already punished my character, here goes nothing. Sit back, we're probably going to be here for awhile. I had a character with no name, no real point in the overall plot other than to act as a figure head for another character and who had about three seconds of screen time so to speak. Then, one day, I figured that I might as well give him a name, since he did need to be referred to on occasion and those kinda things generally require name having. Having obtained a name, Draven then decided he required a personality. Having gotten a personality, he insisted on having relationships. Relationships then meant he needed friends and enemies. That then led to getting a family. This is when things got real messy. He didn't just want any family--he wanted a family consisting of main characters! Characters in the plural!! So suddenly I find that he is the nephew of a major antagonist and the son of a King. Having established princedom, the inevitable could not be denied and Eloise had to meet him and then abruptly he'd a main character too and suddenly my five book series is a seven book series (which has since become eight, btw) and I'm sitting there going 'WAAH?'. And then, because that wasn't enough, he decided he needed his own plot/story arc that coincides with everyone elses and which consecutively spawned two spin-off novels and whole bunch of other characters that I now have to deal with too. The [censored] then became one of my favourite characters. I hate/love him. He was meant to die. Alone. Cold. Nameless. I may yet kill him out of spite. *dpm* On a slightly related note, might I suggest that the reform school also host us a Plot Bunny Day Care Centre? Or maybe you might just need to swnd them ti the reform school too, for perhaps trying to go canabalistic and trying to eat one of your other plot bunnies. Sometimes they can have a bad habit of that. As for characters, can I please introduce Aiden? Aiden is a very bad boy. Aiden was supposed to be a very minor character. Someone for one of my other characters to talk to when she was bored or lonely. Then, all of a sudden, he got himself a bit that was written from his point of view, he turned into a major player in the past history of another main character, suddenly had a sister who, it seems, is vitally important to the stability of their world, and may just prove to be the fulcrum of a major plot development. What do you have to say for yourself, Aiden? Nothing, eh? Useless. You're not even that interesting of a character! You just have your fingers in all the plot pies! Totally love this thread so much I'm going to sticky it. [act]Drags Casey into the foyer[/act] For some reason this character has decided to be dumb, both the stupid and the quiet kind. She totally ignores my pleas and directions. Bit over her now which is not helping my OberNo attempt. Thanks for the sticky, Deb! I'm loving all of these stories about unco-operative characters. They have certainly come to the right place - the Reform School will sort them out in no time at all. And I love the idea of a Plot Bunny Day Care Centre! I've added that into the first post as well. So, I spent most of our write-in today flapping around with a character who just refuses to act anything like how I expected. They are literally my oldest character in that they have existed since I was about eight years old, and apparently this means they think they are the boss of things and can just do whatever they want--which is act not at all to character. I'd send them to the corner to think about what they've done, but they'd take it as a congratulations. I just want to finish this chapter. I've been stuck on it for a month now. My characters are wanting to introduce side plots again, so now I have a case of needing to reform characters and dump some plot bunnies. Just do what you are meant to do, guys! I told you should just have written about chickens. This dumb was-going-to-be-short story has resulted with annoying character deciding he wants more and now he is kinda implying I need to write companion novel to go alongside Inchoate because he is convinced he has a novel worth of stuff to tell and it is actually looking like he does. I'm putting him into the corner before I kill him, I am that mad.